Shabbat, Kosher Cooking Classes, Kollel, Torah Café, and more! 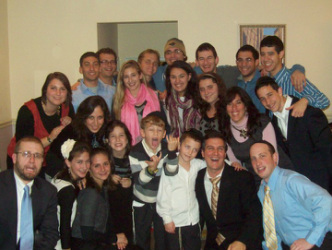 The Jewish Collegiate network was started over 18 years ago at the Towson University campus. Since then Efy and Penina Flamm have selflessly dedicated themselves to reaching out to thousands of Jewish college students on the Towson, Goucher, Johns Hopkins, and UMBC campuses. On Sunday evenings, Penina has already begun her preparation for the 40-50 college students who attend their weekly Friday Night - Shabbos meals. Efy can usually be spotted around campus, shmoozing with students, passing out goodies, or at home baking his famous chocolate chip cookies. The majority of the students who pass through the Flamms’ home have not had any formal Jewish education since their Bar/Bat Mitzvah. Many are active in the Greek life on campus, and often their only attachment to any Jewish life is through the Flamm’s Friday night Shabbos dinners, or some of the JCN’s other programming. Where the JCN excels is in providing a substantial Jewish experience to college students on their terms. On one night during the week Efy can be found giving a Torah café session to a group of students in their off campus apartment. On another night he is providing another groups of students a more in depth Jewish Learning opportunity via the Kollel program. A traditional Shabbos meal with over 40-50 (on occasion more than 80!) fellow students. This festive meal that takes place every Friday night during the semester is filled with great energy, food, and song. Represented at one table could be a group of Alpha Phi sorority girls from Towson, a group of dance majors from Goucher, and another group of AePi guys from Hopkins. No one goes hungry when the students have their choice of a dozen or more dishes that Penina has prepared (roast beef, BBQ chicken, mushroom chicken, deli rolls, potato kugel, noodle kugel, broccoli kugel, cherry kugel, etc. and that is just half of it). On their way out students continue to feast on Efy’s homemade chocolate chip cookies and receive a complimentary “I survived Shabbos” T-shirt as a memento of their experience. These are group study sessions that Efy holds in a student’s apartment. They include a complimentary dinner as well as a discussion on current Jewish events, and other topics that illustrate the relevancy of Judaism to modern day life. These are one on one learning sessions that take place once a week. An interested student is paired with another student, of a more thorough background. The student has the option of learning anything they want: from Modern Jewish Philosophy, to Tanach, or even basic Hebrew Reading. What makes something Kosher? How do I prepare my favorite Shabbos foods from the Flamm’s house? These are classes led by our master chef Penina Flamm who provides a fun interactive way for students to learn how to prepare their favorite Shabbos foods. This follows the ancient rabbinic model where Jewish scholars were reimbursed for their Torah learning. The JCN provides a select group of students with a stipend to participate in an advanced 8 week, in-depth Jewish learning course. The culmination of this course is an entire weekend spent celebrating Shabbos in the Baltimore Jewish community. The vast majority of participants have not only found this program to be enriching but a solidifying influence in their sustained commitment to Jewish life. More information under About the Kollel. A gigantic celebration with live music, costumes, delicious food and over 150 student attendees. This extravaganza is the must attend Jewish party of the entire school year.